NONOTAK, Florence To and Robin Fox are among the artists featured in the Mexico City edition of MUTEK, the international festival of digital creativity. MUTEK MX 2018 takes place from 19-25 November. The programme celebrates audiovisual and immersive digital artworks and experiences. These are presented at locations around the city via a number of smaller event platforms which combine to make MUTEK: Digi-Lab, an experimental digital community space, two Nocturne evening events celebrating audio electronics, two A/Visions events whose immersive digital experiences transport visitors into new worlds, and a closing party featuring Brandt Brauer Frick accompanied by the Mexico State Philharmonic Orchestra and Kuniyuki Takahashi. As part of A/Visions 1, which runs from 21-23 November at Papalote Museo del Niño’s Digital Dome, NONOTAK present Versus. The piece immerses audiences in an abstract non-place which challenges perceptions of space and time. Somewhere between material and virtual architecture, the non-space is built on contradictions and contrasts between sound and image, space and time. 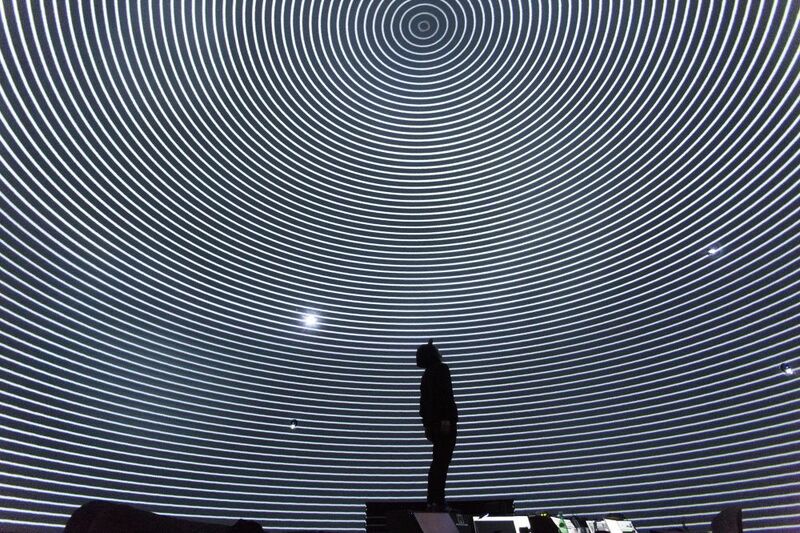 The piece has been created especially for the venue and incorporates the perspectives of assistants placed at the centre of a 360ª universe. Meanwhile at the Museo Anahuacalli, Florence To will present a performance with Kazuya Nagaya on 21st November as part of A/Visions 2. Ambr is a transformative ritual, both analogue and digital. 445 rins (traditional Japanese bowl-shaped instruments) are arranged on the floor in circular configurations; their reverberations interact with electronic processes guided by composer Kazuya Nagaya, while lighting and visuals by Florence To add further reverberations on different planes. Robin Fox takes part in two events as part of MUTEK. At Nocturne 2 at FÁBRICA on 24 November he presents Double Vision 2.0 with Atom TM - the piece combines Fox’s synaesthetic lasers with Schmidt’s deconstructed pop audio.Together, the artists have been exploring the impact of audio-visual synchronicity in a project with multiple iterations; at MUTEK Mexico they present the latest of these. Also at Nocturne 2, Fox presents Single Origin, a solo project combining laser and sound to create a mechanical effect similar to synesthesia. The work features a single laser beam whose movement through a space expands its spatial and sonic geometries.